Located in the historic Jordaan district, this unique houseboat offers 3 elegant studios each with a small terrace and free Wi-Fi. 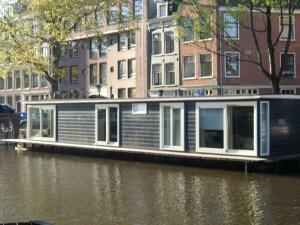 The Guest-Houseboat is only 10 minutes’ walk from Amsterdam Central Railway Station. It includes views of the canal and traditional Amsterdam townhouses. Light décor, a seating area and flat-screen cable TV are provided. Guest-Houseboat also has a kitchenette with a refrigerator, microwave, electric hob and a Senseo coffee machine. The modern bathroom has a shower and hairdryer. The Guest-Houseboat is 15 minutes’ walk from Dam Square which features the Royal Palace and the start of the famous Kalverstraat shopping street. The Anne Frank House is 10 minutes’ walk from the studios.